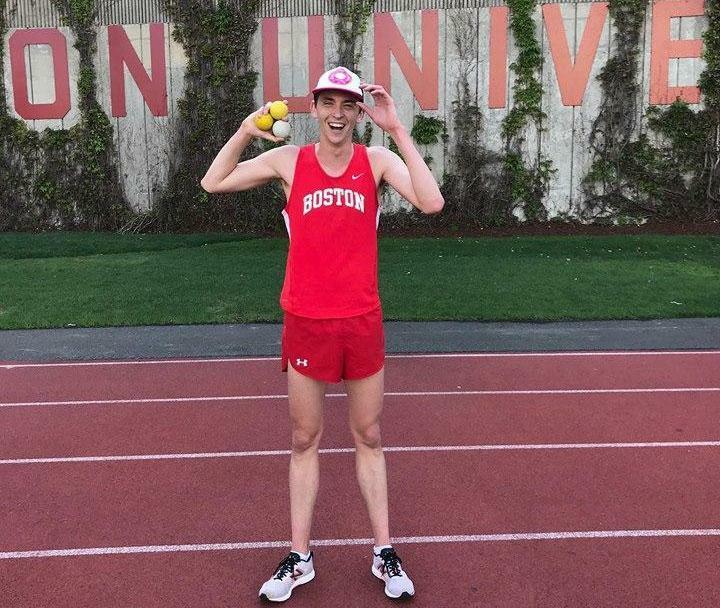 It’s called “joggling” — the art of juggling while jogging — and Boston University’s Zach Prescott just broke the world record. Prescott, who runs on BU’s track and cross country teams, ran the mile while juggling three lacrosse balls on Tuesday. His time: four minutes and 43.2 seconds. His fastest mile time ever — running normally — was four minutes and 19 seconds, he said. “There’s a random cool community of joggling. It’s a nice little niche,” said Prescott, a rising senior who studies business and accounting. An international juggling festival in Springfield this summer will include joggling, he said. He’s planning to go. He learned about joggling last year after his running season ended, and began practicing then, but never got around to breaking the record. So he tried again this year. Kurt Swinson, an American runner, previously held the Guinness World Record for fastest joggling mile at four minutes and 43.8 seconds, which he ran in 1986. On Tuesday, Prescott’s entire running team and several of his friends came out to BU’s Nickerson Field to cheer him on and videotape his run. The first time he tried the joggling mile, he made it two and a half laps before dropping the balls. The second time, he got three and a half laps in before having to start over. “I almost didn’t try it a third time, I was getting really tired,” Prescott said. On his third try, he finally completed his whimsical athletic feat. “Getting the hang of it is hard, but once you get used to the speed when you’re running, you’re pretty much just juggling in place … It’s so much more about focus. You have to get into a rhythm,” he said. Even though it was difficult to get used to, Prescott said he and his friends hope to get more into joggling in the future. “All it takes is someone who loves to run,” Prescott said.